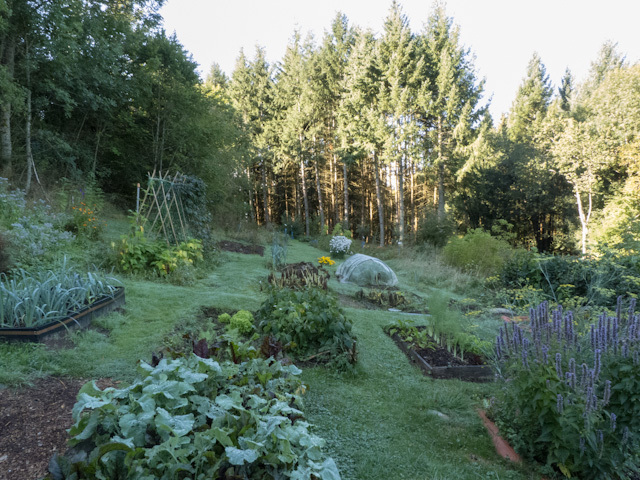 As September draws to a close, it’s getting later and later before the morning sun falls on the garden. We were out fairly early today, doing some weeding and general autumn tidying, and the sun was just high enough to catch the tops of the trees. The beds were still in the shade, and it was, to be honest, a bit on the chilly side. 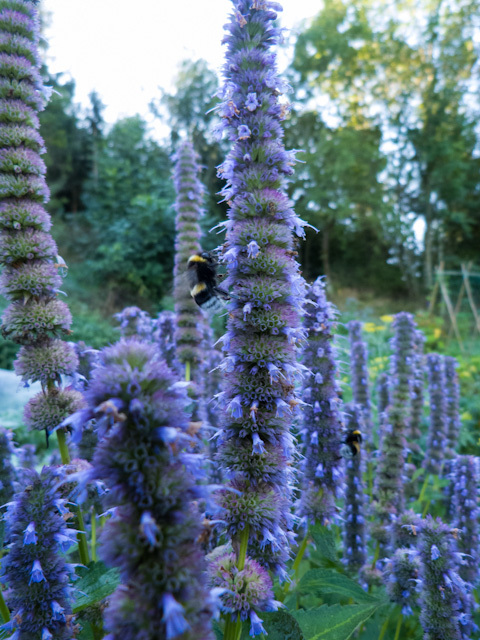 I was surprised to find that our hyssop, which is the blue-purple colour plant at the bottom right of the photo above, was already busy with bees. The hyssop has done wonderfully well this year, growing from almost nothing to a fair-sized bush. 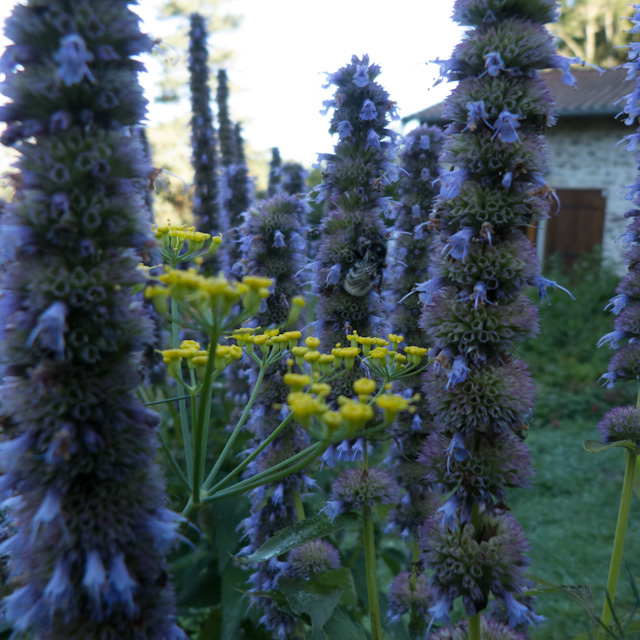 It is planted next to a herb fennel, which is also huge, and I love the contrast of the upright blue hyssop flower stems with the lacy acid yellow of the fennel bracts. Can you make out the strangely pale bee on the middle hyssop spike? The hyssop in particular attracts flying insects of all kinds, but I was surprised to see the bees out before the sun was on the plant. I suppose they have to make the most of every opportunity to gather valuable nectar at this time of year. Hopefully the hyssop, together with our borage, calendula and the asters pictured below (and photographed later in the day), will keep blooming until the first severe frosts, and keep providing the bees with food. What a beautiful garden. I have aspirations of planting a vegetable and herb garden at the cottage. Maybe next year. It’s taken a while to get it to this stage. It was basically part of the surrounding woodland when we moved it, so we had to fell quite a few trees. We’ve planted an orchard at the far end though, to replace them. 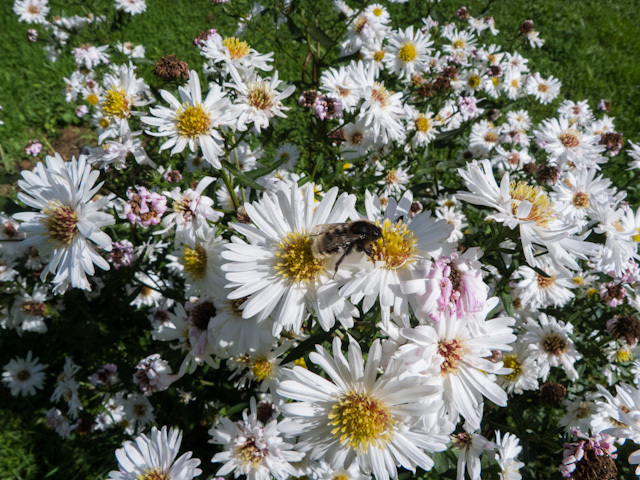 You have a beautiful garden in France, love the photo too of your Asters with the bee.